Cumulus Media Inc (NASDAQ:CMLS) stock price has been surging on increasing volume over the last few trading days. Since the beginning of March the stock has climbed more than 100%. CMLS is breaking out in a big way after trading sideways for the last six months or so. CMLS just recently released its fourth quarter and full year 2015 results which were not so great. Revenue and EBITDA were down significantly year-over-year and for the quarter. It has a crushing debt load that is putting a lot of duress on the company and its ability to operate. Creditors will likely push this company into a turnaround or attempt to find ways to extract value from the company. CMLS has over $2.45 billion in outstanding liabilities and only $359 million in current assets. Debt to total assets is over 75% and continues to climb. While radio business (radio broadcasting) is struggling with numerous competitors from high-tech firms like Pandora and Apple, there is still room to be profitable if the company can figure out a way to restructure its crushing debt load which is weighing down on its profitability. CMLS reported a loss of over $0.5 billion for 2015. CBS broadcasting is actually providing a decent return to investors and profitable business. 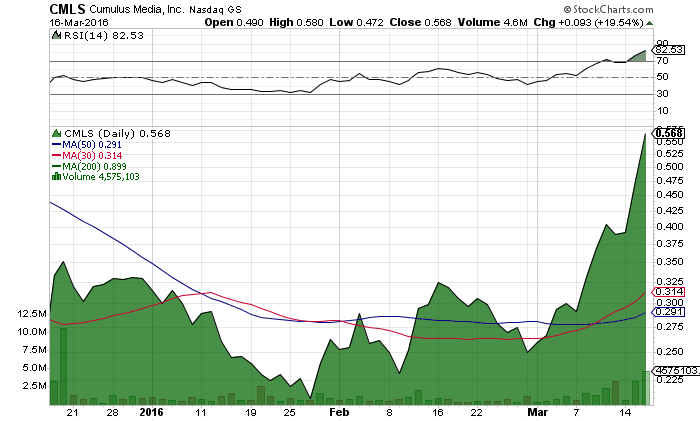 Technically speaking, CMLS is in breakout mode. The stock is trading above its 10, 30, and 50 daily moving averages which is short-term bullish indicator. Couple this with the fact the stock has broken out of its trading range on high volume will lead the stock higher as short-term and momentum traders attempt to make a quick buck. CMLS will face heavy resistance between the $0.61 level and $0.80 level. CMLS is a radio broadcaster in the United States. It is also a provider of country music and lifestyle content through its NASH brand, which serves through radio programming, NASH magazine, concerts, licensed products, and television or video. The core product lines include broadcast advertising, digital advertising, political advertising and non-advertising based license fees. It provides content that is distributed through over 460 owned and operated stations in approximately 90 the United States media markets, over 8,500 broadcast radio affiliates and digital channels. It provides sales and marketing services for 11 radio stations in the United States. CMLS is currently trading at a $161 million market valuation. CMLS is operating in a declining industry which does not bode for the company overall. There are other radio broadcasting companies that have remained profitable and it seems the main issue for CMLS is its crushing debt load. The stock is currently in breakout mode, but don’t be the one holding the bag. Remember the exit is small. Stay tuned for updates. We will be updating on CMLS when more details emerge so make sure you are subscribed to Microcapspot so you know what’s going on with CMLS. Disclosure: we hold no position in CMLS either long or short and we have not been compensated for this article.